HHNFT Director Radchada Chomjinda (left) graciously accepts a donation from Pattaya Sports Club President Maurice Roberts and Social Welfare Chairwoman Noi Emerson. 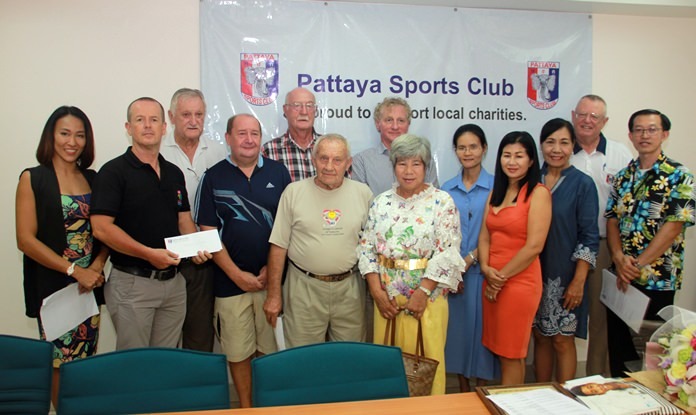 The Pattaya Sports Club donated 667,990 baht to 11 charity organizations as part of its long commitment to support the community. President Maurice Roberts and Social Welfare Chairwoman Noi Emerson presented the donations at the PSC headquarters on Third Road April 26. 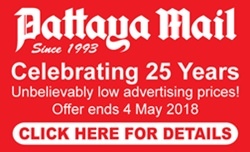 The benefactors this year were the Human Help Network Thailand (75,500 baht), Sotpattana School for the Deaf (33,250 baht), HHN Drop-In Center (100,000 baht), Pattaya Orphanage (60,000 baht), Baan Jing Jai (10,000 baht), Father Ray Foundation (38,240 baht), Father Ray Day Care Center (38,240 baht), Good Shepherd Foundation / Fountain of Life (150,000 baht), Ban Khru Boonchu House (50,000 baht), Ban Chang Community Hospital (50,000 baht), and Mercy Ministries (50,000 baht). Fr. Ray Foundation representative Derek Franklin (center left), receives a benevolent donation from Pattaya Sports Club President Maurice Roberts and Social Welfare Chairwoman Noi Emerson.